Did I love, love, love Irene Hunt's Across Five Aprils? Probably not. Did I love it a lot more than I thought I would? Yes, definitely. Across Five Aprils is a Newbery Honor Book. This May I'll be focusing on Newbery honor books and winners published in the 1960s. I probably wouldn't have picked this one up if I hadn't been doing a Newbery challenge or two this year. I'm very glad I read this one. 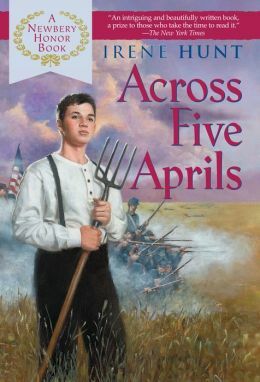 Across Five Aprils is historical fiction. Jethro Creighton is the hero of the novel. It opens in April 1861 and concludes in April 1865, I believe. Readers see the Civil War through his eyes. He is not a soldier, he's just a boy. His older brothers, however, do go to war. (This one is set in Illinois). Most of his brothers fight for the Union, but, one of his brothers, his favorite brother, fights for the Confederacy. Jethro tries to keep up with the war news as well as he can, mainly through newspapers he picks up when he does manage to get into town, but also from letters home from his brothers. Jethro is busy enough on the farm. He's essentially running his family's farm. Readers get an opportunity not only to get to know Jethro, but his family as well. I was most interested in his sister, Jenny, and his schoolteacher, Shadrach Yale. There were many things I liked about Across Five Aprils. I thought the characterization was very well done. Some of the scenes were just wonderful.